Thank you for visiting our website. Please go to the ABOUT US link to find out what we are about. To navigate the site click on the links below the banner picture. BERA would like to keep you up to date with what’s happening. Please register with us. Click the BERA needs you icon to register. Proposed Footway parking bays at Edgwarebury Lane between Blackwell Gardens and A41 Edgware Way, Edgware HA8. If you are interested in what is being proposed please click HERE. To see a plan click HERE. Click your browsers BACK BUTTON to return to this page. March 2018. The Federation of Synagogues has recently lodged their amended planning application (reference 18/1701/S73) to build a cemetery on the site of the former Camden Sports and Social Club, Edgwarebury Lane HA8 8QP. We have until 2oth April 2018 to comment. If you are interested in making a comment click the LINK. December 2017. Proposed Cemetery Edgwarebury Lane (former Camden Sports Ground) For anyone who is interested there will be a public exhibition detailing what is proposed on Wednesday 13th December 2017 from 6:30pm to 8:30pm at Broadfields Primary School. Unfortunately the unanimous council decision to reject the proposed golf course has been overturned at appeal. If you are interested in reading the reasons please click HERE. February 2017. As you hopefully know the appeal hearing date for Bury Farm starts Tuesday 28th February 2017 at 10am. We would like to know how many people want to attend and or would like to speak in support of Bury Farm. We already have the support of several local councillors and MP’s who will speak in favour of Bury Farm. February 2017. Plans to develop part of Bury Farm into an 18 hole golf course, appeal hearing date starts Tuesday 28th February 2017 at 10am. The hearing is scheduled to last 5 days. Developers are trying to overturn Barnet councils unanimous decision to reject their plans to build an 18 hole golf course. Details of the hearing dates and venue can be seen HERE. The planning application documents lodged by the developer can be seen HERE. July 2016. Plans to develop part of Bury Farm into an 18 hole golf course. There has been an appeal to the Secretary of State because the Council refused planning permission. 1. Direct LINK to the case on the the Planning Inspectorate website. 2. Email to robert.wordsworth@pins.gsi.gov.uk quoting reference APP/N5090/W/16/3151579. March 2016. Barnet council has set a Committee Date for planning application 15/07732/S73 in respect of the Land formally Camden Sports Ground to be developed into a Cemetery which is scheduled for Thursday 31 March at 7:00 pm. You can view the report which is Recommended for Rejection HERE. Should anyone wish to attend, the venue is Hendon Town Hall, The Burroughs, London NW4 4BQ on Thursday 31 March at 7:00 pm. March 2016. Barnet council has set a Committee Date for planning application 15/03137/FUL in respect of the Land at Broadfields Primary School which is scheduled for Wednesday 16 March at 7:00 pm. You can view the report which is Recommended for Approval HERE. Should anyone wish to attend, the venue is Hendon Town Hall, The Burroughs, London NW4 4BQ on Wednesday 16 March at 7:00 pm. January 2016. Barnet council has sent a date for comments to be made on the revised plans for housing on the land formerly Broadfields Infants School. We have until 4th Feb 2016 to comment. January 2016. Barnet council have also set a date for comments to be made on the revised plans for a new Cemetery on the land formerly Camden Sports Club. We have until 2nd Feb 2016 to comment. November 2015. Golf Club planning application permission – “REFUSED”. The Committee met on Thursday 26th November to decide the planning application for the proposed Golf Club. It was a very lively meeting. Speakers included London Assembly member Andrew Dismore, Councillors Helena Hart, Hugh Rayner and Daniel Thomas, Matthew Offord MP, and two members of the public, Prof. Michael Streat and Mr Robert Davidson. All spoke in objection to the proposal. Hopefully this should send a clear message to the developers from the locals who wanted to be heard. November 2015. The Committee Date in respect of the Golf Club planning application has been announced as Thursday 26 November (at 7:00 pm). SeeHERE. At this meeting a decision on the proposed Golf course development will be made. Further details and an agenda will be available on the council website HERE in due course (probably from a week before the meeting). This meeting is the last place the public can make their feelings heard. If you feel you are able to attend the meeting please monitor the council website to make sure the date doesn’t change. October 2015. Barnet Council have now made available online amended plans for the proposed redevelopment of the old Broadfields Infant School site. Click HERE for full details and plans of the proposed development. Comments can be made on the Barnet website, by email or by post. June 2015. Barnet Council have sent out a letter detailing amended plans to a proposed 18 hole golf course with clubhouse, associated car parking, landscaping and access from the A41. We only have until the 7th July 2015 to make comments about the proposal. Comments can be made on the Barnet website, by email or by post. June 2015. Barnet Council have sent out a letter to local residents (within a 100metres of the proposed development) regarding an amended plan for a residential development on the old Broadfields Infants School site. We only have until the 3rd July 2015 to make comments about the proposal. Comments can be made on the Barnet website, by email or by post. March 2015. Barnet Council exhibit plans for the redevelopment of the old Broadfields Infant School site. You can check out the what went on HERE. March 2015. 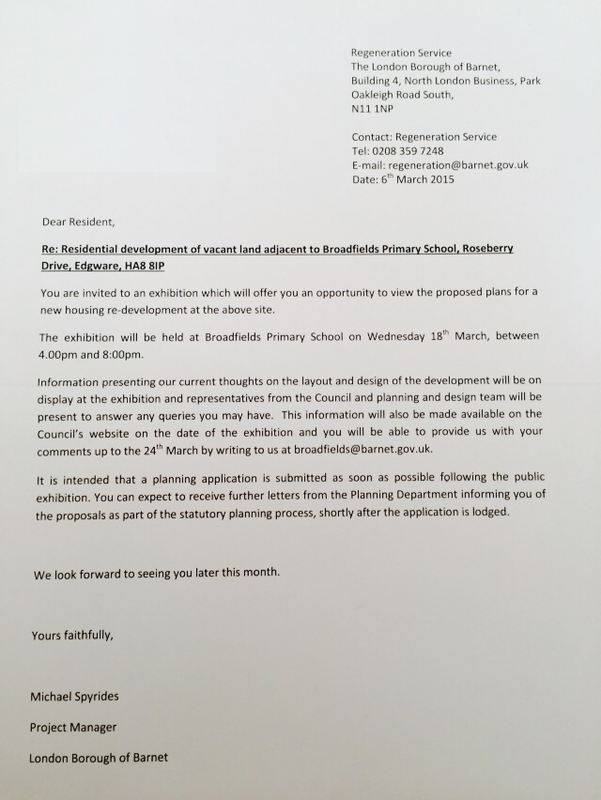 Barnet Council have sent a letter to local residents about the redevelopment of the old Broadfields Infant School site. You can see the letter by clicking HERE. Feb 2015. Barnet Council extends the deadline for people to file comments on the Plans to develop part of Bury Farm into an 18 hole golf course until 19 March 2015. Feb 2015. Green party objects to Plans to develop part of Bury Farm into an 18 hole golf course. You can see the reasons why the Green Party objects by clicking HERE. Feb 2015. Environment Agency objects to Plans to develop part of Bury Farm into an 18 hole golf course. Although this doesn’t mean the plan will be rejected by Barnet it is a major blow for the golf course developers. You can see the reasons why the Environment Agency objects to the plan by clicking HERE. Jan 2015. Plans to develop part of Bury Farm into an 18 hole golf course re-submitted. The re-submitted application is on the Barnet website and comprises 40 documents. You can view it by clicking HERE. We only have until 24th February 2015 to object. You can voice your opinion by clicking on the MAKE A PUBLIC COMMENT. A new petition to reject the planning application to develop part of Bury Farm into an 18 hole golf course has been setup on the Barnet website. Please sign our e-petition its quick and easy by clicking the link below. Once you complete the details you will be sent a confirmation email that you will need to acknowledge. If you don’t get an email check your Email Junk folder. Andrew Dismore AM, Labour London Assembly Member for Barnet & Camden and Labour parliamentary candidate for Hendon is continuing his support for Bury Farm by setting up a petition on his website. Dr Matthew Offord Conservative parliamentary member for Hendon is also happy to show his continued support for Bury Farm and has said that he will be making representations. For everything you want to know about Edgware. Inside Edgware is a facebook page to allow the Edgware community access to information on crime figures locally and to provide updates about Edgware issues. The page is operated by the Edgware Ward Panel, the CAP for Edgware Ward in Barnet London Borough.